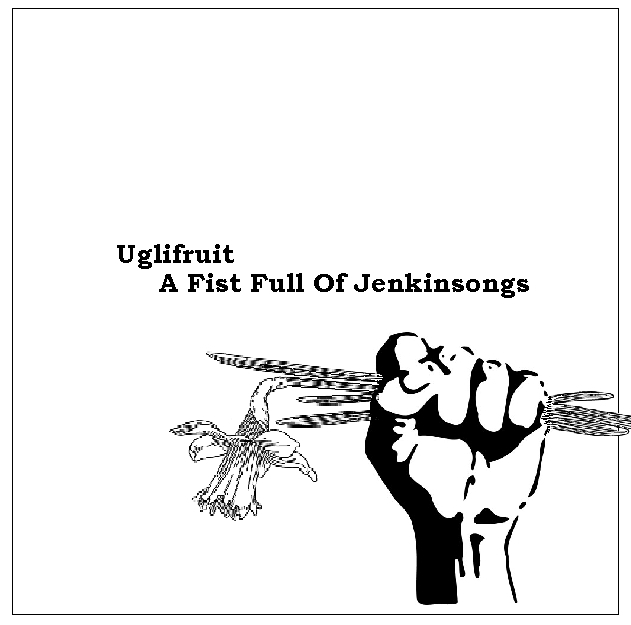 Uglifruit: A Fist Full Of Jenkinsongs. 08 – What’s Wrong With This Picture? Songs & Playing by Andy Jenkinson, Feb 2011. Hey m’lady what do you see? I’m soaked to the skin and you won’t let me into your castle I’m mortified! And when you’re done with me what will become of me? For the kingdom’s economy you’d sleep with your enemy. 04 Over you baby, And Moving On. I’d be over you baby and moving on right now. Who knew our loves chances were through? 08 What’s Wrong With This Picture? We’re stronger than that, aren’t we? He makes me feel …oh…. Shepherds delights tonight it’s only right do you realize? A not-very-veiled reference to 'Unreleased Backgrounds', an a cappella Beach Boys track on the reissue of Pet Sounds. This is actually an experiment I was playing with for background vocals for 'Kissing Goodbye'. The idea was abandoned, and recycled subsequently recycled here. Unashamedly poppy. I wanted to be Jellyfish in this song. I pretty much always want to be Jellyfish, who doesn't? Spot the Beatles quotation in the BVs. A simple tale of fairy tale disappointment. Why am I not the white knight on the horse? Described by a friend as Schizophrenic, and I can see his point, but it all makes sense in my head. I like singing quickly. My obvious homage to Phil Spector. A spiritual sequel to 'Will You Love Me Tomorrow'. "School is a battlefield for the heart"- Angela Chase (My So Called Life). Spot the Police quotation in the BVs. Featuring Sarah Marshall on vocal, and lifting the song in the process. As big-band swing as I'm likely to get, and great fun to do. The song illustrates that I'll never be Frank, Dean, Sammy or Harry Connick Jnr. I'd been listening to Richard Hawley, hence the guitar sound. I'll never be Richard Hawley either, it turns out. Unusually for me, a guitar-riff based song! As well as those other people, I'm not Slash either. The song laments the fact that life is simpler when you are young and innocent. The instrumental break is supposed to transport the listener to a time of sitting in front of a NES. I don't know if it succeeds, but it sounds pretty/blippy. Mike Skinner has got nothing to worry about, but troubling him that was my intention here. My fascination with layers is explored at the end of this one. And of the poetry in slightly mundane lyrics about life. Listening to late era Beatles? Me? *cough*. Well, if you had a mellotron virtual synth what would you do? Slightly silly, slightly bluesy - a slight little song. A kiss goodbye, from me to you. Thanks: Alex Benyon for masterful mastering.